GREENBELT, Md. — Maryland transportation leaders are suggesting 18 possible ways to reduce congestion on the Capital Beltway in the state and part of Interstate 270, and they want to know what residents think. The 19th option is to do nothing, but the Maryland State Highway Administration warn that would allow traffic to worsen. The ideas were unveiled Tuesday evening at a public workshop at Eleanor Roosevelt High School in Greenbelt. Late last year, Maryland Gov. Larry Hogan announced a multibillion dollar plan to widen the Maryland portion of the Beltway, I-270 and the Baltimore-Washington Parkway, add toll lanes on each, and pursue a public-private partnership to pay for it. 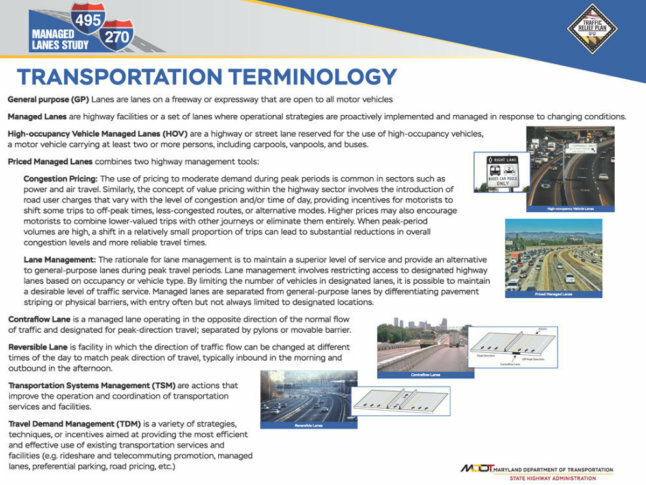 Now the Maryland State Highway Administration is studying the toll lane idea as well as alternatives for the Beltway from south of the American Legion Bridge to east of the Wilson Bridge, and I-270 between the Beltway and I-370, including the east and west I-270 spurs. A separate study of I-270 between I-370 and I-70 is scheduled to start next year. The options laid out Tuesday include adding various combinations of general purpose, HOV or toll lanes, or converting existing lanes from one type to another. There are transit options, too. “That would either be accommodated through the lanes, or through a separate alignment … it could be a heavy rail, light rail or a bus rapid transit,” said Jeff Folden with the Maryland State Highway Administration. No matter what is settled on, don’t expect any construction anytime soon. “It wouldn’t be for a few more years at least. (It will take) about two more years until the environmental study is complete, and construction would take time after that to start,” Folden said. Wednesday, July 25 at Thomas W. Pyle Middle School in Bethesda. Comments can be made online. View Tuesday’s full presentation on the SHA’s website.